This expert-led discussion was filmed at the ACI congress, London on the 17th January 2019 with Professor Adrian Banning moderating a discussion with Professors Hildick-Smith and Prendergast. 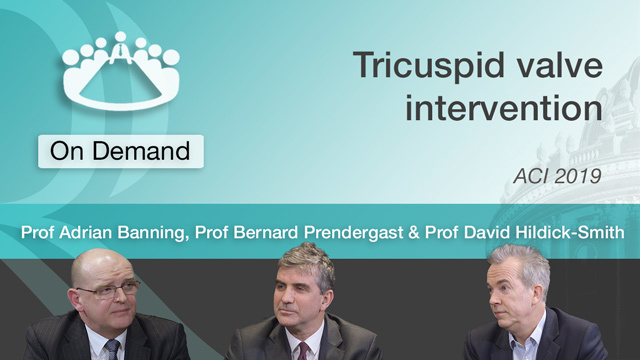 This footage aims to highlight the developing field of tricuspid valve intervention and discuss the current options available to interventional cardiologists to treat these patients, whilst debating how novel technologies may improve outcomes. The challenges with the tricuspid valve. Existing technologies to treat tricuspid valve disease. How expert operators are deploying these technologies in their daily practice. Emerging Technologies that may improve patient outcomes that are being studied.